Evening guys! So today was the day we have been preparing for all season. It was the Girls on the Run 5k. I was a little worried last night when it was raining and it was predicted to storm all day. I was equally worried when I heard the rain as I got ready and drove through the rain to the Georgia Tech campus, the BEAUTIFUL site for the run. Once we all got there, thankfully it was delayed 1 hour. After this time, the sky was cloudy but the rain had stopped. It was a great run! What a great inspiration to see young girls run and feel empowered to be themselves and achieve great things! When I got home, I showered and immediately took a nap with my kitty, Pumpkin (16 years old, blind,and sick; please keep him in your thoughts and prayers). Then I read for a bit and piddled around the house before I went to the store to buy the ingredients for dinner. 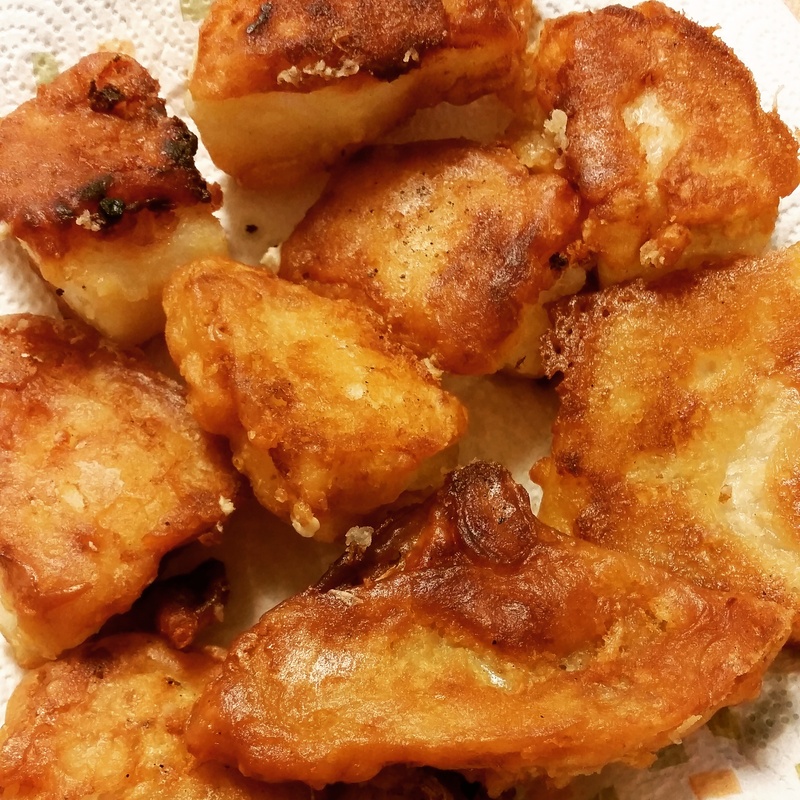 1 1/2 pounds of firm-fleshed white fish cut into “nuggets”, but you can make them in to strips, or whole pieces if you want. I used cod, but you can use any white fish you like. Whisk together slowly with 1 cup of brown beer. Refrigerate for 15 minutes. Heat some vegetable oil in a pan. 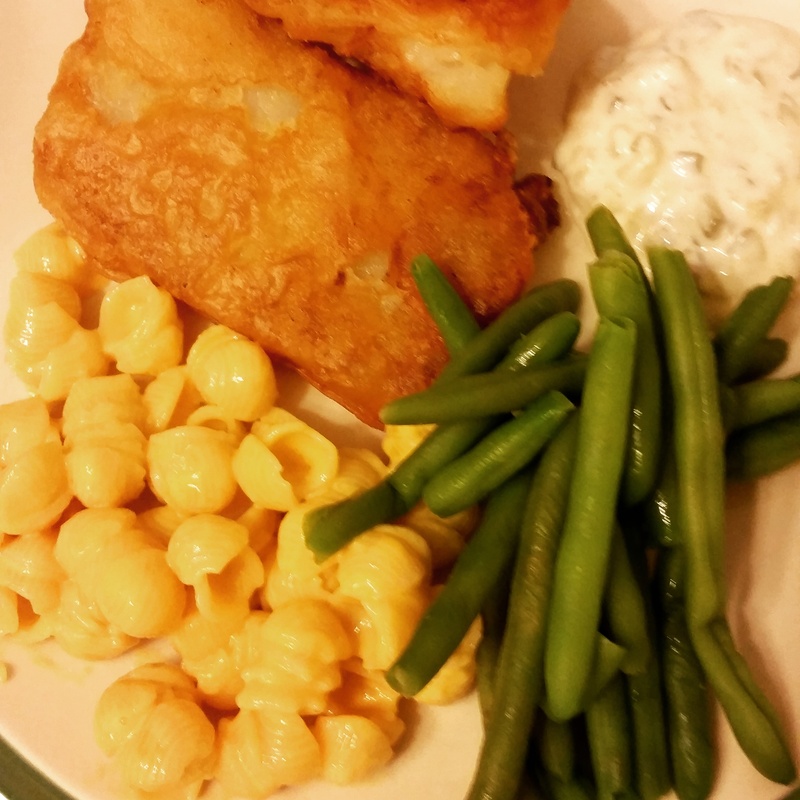 While it is heating up, dredge your fish in some cornstarch and tap off any excess cornstarch. Dip in to the batter and put in oil. Don’t crowd the pan. When the batter is set on one side, turn the fish over and cook until golden brown and delicious. I served with some Annie’s Mac and Cheese and green beans.